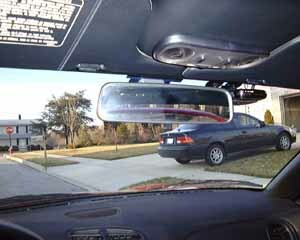 Raising your rear view mirror a couple of inches will greatly improve the view out the front of the car if you are taller than about 5' 10". Medium Philips head screwdriver 1 new, straight, flat razor blade razor knife -- the longer the blade the better or get a windshield cutting wire (it's made to do this) from an auto parts store. Remove the mirror & intermediate bracket. using the razor knife, cut the black goo under the bracket on the glass, going around the perimeter, working the blade in/under progressively. once this bracket is off, scrape the back of it absolutely smooth with the flat razor blade, then scrape the rest of the goo off of the inside of the glass. consult the phone book for a glass shop near you. they will have the special 3-m adhesive to glue the bracket back onto the glass. we placed mine exactly between the black spot and the top of the glass, as seen from the outside of the car. the shop I went to performed this service for free. the man who did this was very careful not to spill a drop of anything on or in my car, and cleaned the windshield inside and out to boot. he did good work; I tipped him $5, my only cash outlay for this project. Rear view is now about a half inch from the roof. view out the back is essentially unchanged ... if there is a hill behind, I can't see cars so far up the slope (big whoop), otherwise rear & side vision is unchanged. front view is MUCH better. no more ducking to see! why didn't I do this ages ago? it's simply astonishing the improvement that moving the mirror up about 2" makes. No vibration with this process. Visors will require some attention to deploy -- pop & pullback -- but who cares. I just did Barry's mirror move and it is a great improvement. I was a little too aggressive in removing the mirror and pulled a small chunk of glass off with the mirror mount. I used flat black paint and a small brush to paint the chunk to match the black square where the mirror was originally mounted. Looks good. I used Locktite's brand of rear view mirror adhesive (available at auto parts stores). 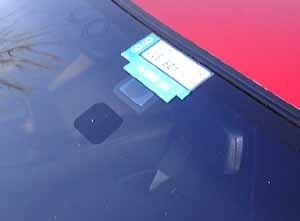 Locktite recommends a temperature range of 50-70 degrees F for the adhesive so I used a blow dryer to warm the windshield, mirror mount and adhesive. This is a really good mod if you are over 5' 11".